The EnviroSlopeTM System with stacked (tiered) Geoweb® sections is an economical solution to create attractive vegetated reinforced soil slopes and is recommended for slopes up to 70 degrees. The facing material for this option is the Geoweb cellular confinement material 150 mm high at each level, three cells deep, and stacked and stepped back each layer to create the slope required. The front cells are filled with seeded topsoil during construction. 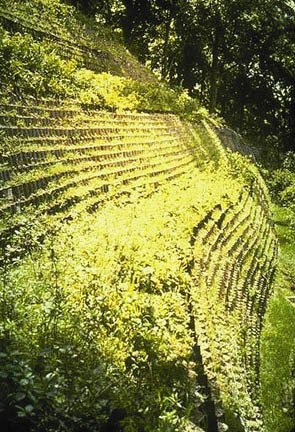 Uniaxial geogrid soil reinforcement is typically installed as required by the design to construct the steepened slope to the required slope angle. The EnviroSlope steepened slope structures provide advantages in right of way and reduced space that could not be achieved with the slope of an unreinforced embankment. The system offers environmental advantages over typical MSE block walls by allowing stormwater to collect in the open front facia. Project specific evaluations are available for product recommendation and design.